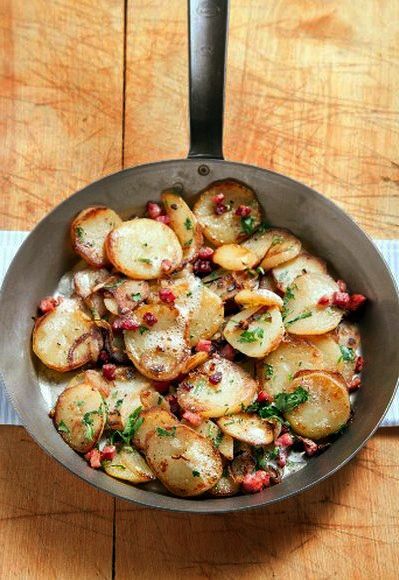 Thinly slice the potatoes and coat with 1/2 the olive oil. Season with Cajun seasoning. In a large skillet heat the remaining half of the olive oil until it starts to ripple. Add the diced andouille and cook through, but don't over cook it. Remove the andouille from the pan. Add the sliced potatoes to the pan that the andouille was cooked in and saute the potatoes in the rendered fat. When the potatoes start to get crispy add the garlic. Continue to cook until the edges of the potatoes start to brown. Add the andouille back to the pan.